This year I bought heritage currant tomato plugs from Dobies. They've been amazing, they taste great, store well if dried and the yield from them has been phenomenal. I definitely want to grow them again next year. I'm saving the seed from a few of the tomatoes and this is how I'm doing it. 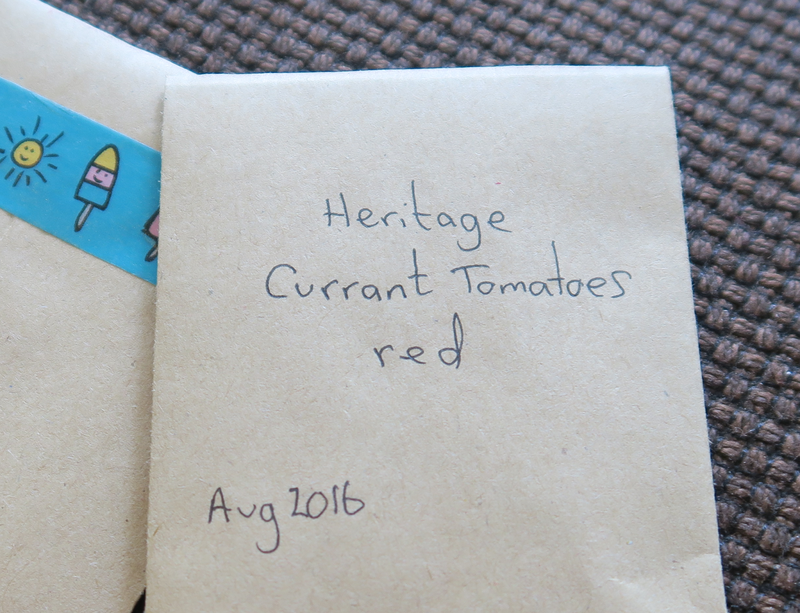 Pick your best tomatoes from the strongest plant to save the seed from. You want to replicate these strong plants next year. Squeeze out the seeds onto some paper towel or kitchen roll. If left in the wet flesh seeds can go mouldy. Spread the seeds out so they dry more quickly. I leave my seeds in a cool dry place to dry out for 24 hours. The seeds will stick to the paper towel. I pick the seeds off the paper towel and store them in a labelled paper envelop. You can fold up the paper towel and store it with the seeds stuck to it. The paper towel can be planted in the spring with the seeds still attached. Remember not to put the seeds in plastic as they can sweat and become mouldy. Store the paper envelope in a cool dry place.